Halloween Month is Officially Here! How does your favourite Halloween store prepare for the most important day of the year you ask? Well. With a pumpkin of course. Stats Canada notes that in 2016, the total weight of marketable pumpkins was 80 712 metric tonnes, grown over 3429 hectares of land, and worth an estimated $25.9 million in farm gate value! Make sure to pick the freshest pumpkin you can find, that way it will stay picture perfect longer! Use a sharp, serrated blade to make the entry point (may we suggest cutting a lid on the bottom of the pumpkin – because it is easier to place your pumpkin over the light, rather than try to light it from above). Don’t worry, we will share more tips later this month, but if there is anything you do, for a perfect lantern? Please send us a tweet! Besides picking our costume (because clearly that is the BEST part of Halloween) the next step to prepare for in our #coundowntoHalloween is whip up the Treat that comes after Trick! We shared with you our quick and easy Monster Eyeball Brownies, and you retaliated with a tonne of great Halloween baking. 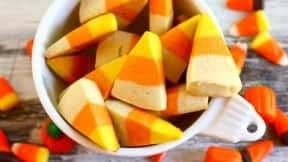 We want to try our hand this Halloween at making some sweet Candy Corn Cookies like these ones from Coastal Living. YUM!